In the eight years since the first iPhone launched, no company has done more than Apple to change the dynamic and balance of power in the mobile industry. Apple’s latest move is called the iPhone Upgrade Program. Following the lead of US mobile operators, Apple will sell its new iPhone 6S and 6S Plus on a monthly installment plan, starting at $32 per month, with annual upgrades to the latest model. Instead of choosing a carrier first and a phone second—the way many people still buy mobile phones—you’re now choosing Apple first and a carrier next. Today, more than 60% of consumer-purchased smartphones in the US are still bought from an operator retail store or website, according to comScore. By selling unlocked phones directly, Apple stands to potentially increase its customer loyalty—and marginalize the value of carriers, pushing them further into “dumb pipe” classification. 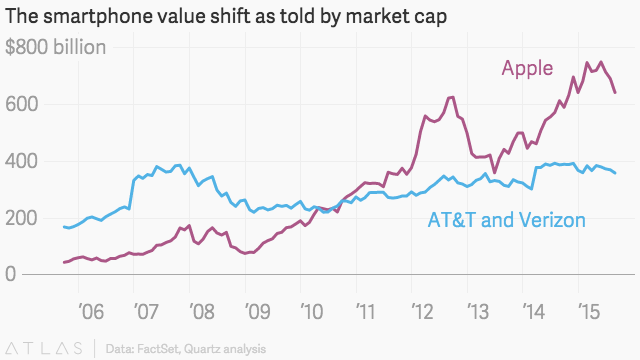 But it’s not a crazy idea that Apple could play an increasing role in how people choose and buy wireless service. Especially after considering how the iPhone has already transformed the mobile industry in many ways. That started at launch in 2007, when buying and owning an iPhone was immediately a different experience than any prior mobile device. Apple handled phone activation, media management, and software updates independently through iTunes, and made its built-in “visual voicemail” a feature of the phone app instead of a carrier service that could be sold separately as an add-on fee. In 2006, carriers were pushing lousy, Windows-powered smartphones branded after themselves—the “AT&T 8525” is just one forgettable example. Meanwhile, Apple didn’t even allow operators to put their logos on the back of the iPhone. A year later, Apple launched the iPhone App Store, another service the carriers used to handle exclusively through branded “decks” or portals. Over the years, Apple added free text messaging (iMessage), video calls (FaceTime), and phone calls (FaceTime Audio), often competing with paid carrier services. These helped force operators to change the way they priced their service plans, from per-minute and per-message buckets to unlimited-access calling and texting plans with metered data consumption. This change in power has dramatically improved the customer experience. But it has also translated into popularity and profits for Apple—and a real value shift over the past decade.